Even though most people strive to live independently, there are times when living alone means that there is no one to assist you should you need help. 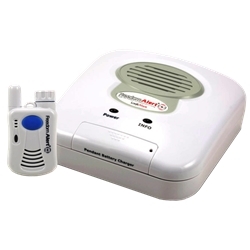 Whether you are a senior, a baby boomer or an adult with aging parents, Freedomalert will provide you and your family with the reliable safety and security when it is most critical. FreedomAlert is the first personal security product ever to allow 2-way communication through your wireless pendant. It is also one of only two systems that are legally allowed to call 911. The system can easily be programmed to dial up to 4 numbers of your choice so you can rest assured that your family, friends or neighbors are just a push of a button away. In addition to the pre-programmed numbers, this system can call 911 in case there is no answer. It can be used anytime and anywhere around your home.